In the vineyard, there are stones letting you know how far away you are from different Italy landmarks as well as other Masi locations. A number of different varieties grapes are dried out. Grapes after they've been dried using the Appassimento method. Grapes are separated by variety into bamboo trays like these, although much larger. Dried grapes can produce a much more flavorful wine. This method has been used since ancient times to make wine in the area. Wines are aged in barrels, and tasted during the aging process to ensure they maintain quality. 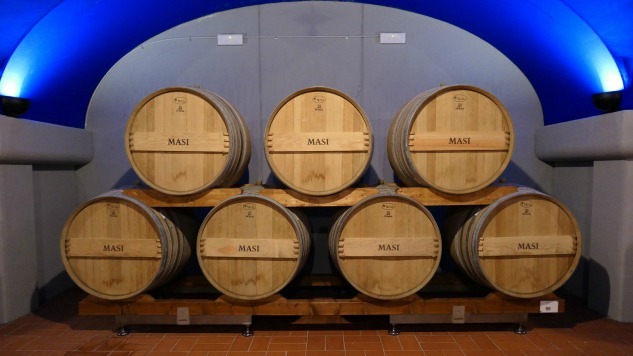 Masi has a number of different barrel rooms used for aging. These larger barrels are also used for aging. A sampling of some of Masi's wines. A little outside of downtown Verona, Italy sits Masi, a family winery that produces some of the best wines in town. Named after “Vaio dei Masi,” the small valley in Valpolicella where the winery sits, it’s known for its Costasera and Campofiorein, amongst its other wines. Much like other Italian wineries, wines at the Masi are made using the traditional grapes that are native to its particular plot of land, as well as winemaking techniques from the Venetian area. One of those techniques is Grape Appassimento, the process of laying grapes out on bamboo racks over the winter and drying them before turning into wine. Developed centuries ago, the ancient process is still being used on-site by the Boscaini family, who owns the land, and has passed down the technique from generation to generation. By removing some of the water from the grapes prior to winemaking, Masi is able to get more concentrated aromas and tastes in its wine. The process is used in a number of wines, but particularly in the winery’s Amarone. While prevalent in Italy, you can buy some of Masi’s wines in the United States as well. We took a tour of the winery (and did some tasting) during a recent trip to Italy. Check out what we found in the gallery.